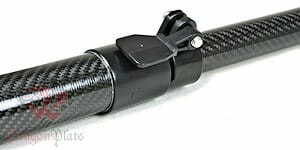 Dragonplate rugged telescoping tube assemblies are constructed from twill/uni carbon fiber tubes. The combination of additional wall thickness and hybrid twill and uni-directional material provides a more robust construction without sacrificing rigidity. The clamp-style tube connectors are appropriate for both high bending and high axial load applications, and are user-adjustable to ensure adequate clamping force is provided and repeatable without the need for further adjustments in the field. Available in lengths up to 8 feet long, and allows the use of high modulus carbon fiber tubes, providing up to 3 times the stiffness of a standard telescoping tube.